I’m always on the hunt for new breakfast ideas that are healthy and filling. 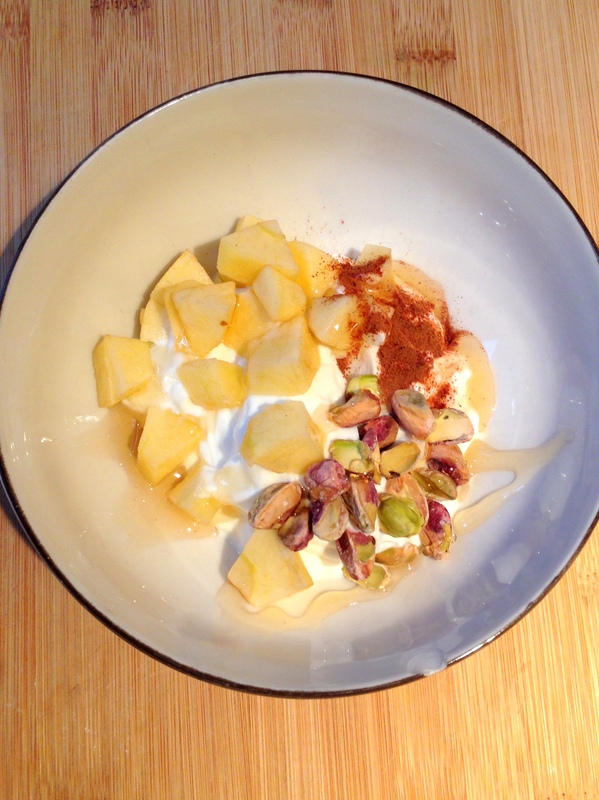 Since we had tons of apples from our apple picking adventure I thought about how good apples would be with Greek yogurt, right? Here’s what I threw together and have been eating now for a week – it’s the perfect combination of fall flavors. Try it, let me know what you think! We are constantly cooking in our house and from a very early age we knew it was rubbing off on our Z. We put her tiny kitchen (we got the wood DUKTIG Play Kitchen one from Ikea, I highly recommend it) in our kitchen so we could all cook together at the same time. Well, I had been noticing the past year or so she wants to get in there and REALLY cook in the REAL kitchen. 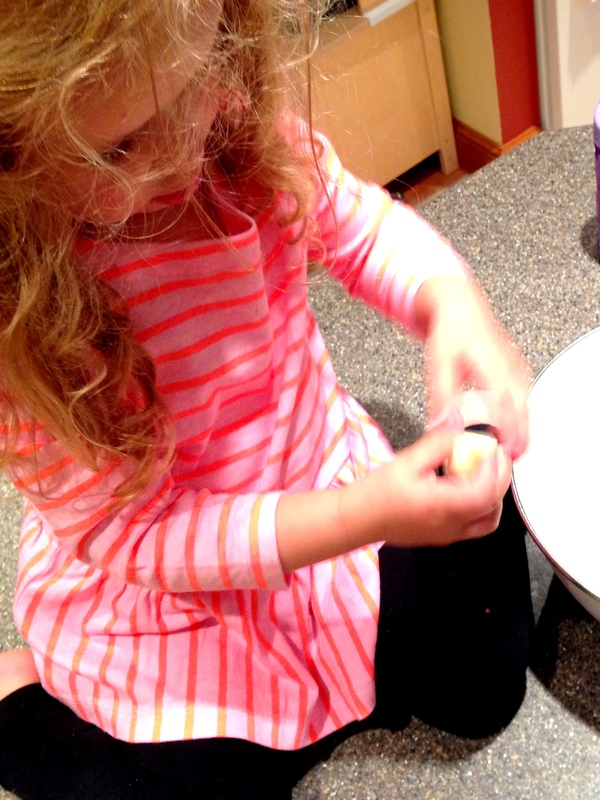 So, over time, I’ve pulled together some ideas of how your toddler can actually help you cook. It’s great when I start to cook and Z walks up and says “I help?” and I can actually respond with a list of things she can do to really help – after washing her hands first, of course! Placing items onto a baking sheet or in a bowl after they’re chopped/cut. Especially in the fall/winter, we’re always baking and roasting. 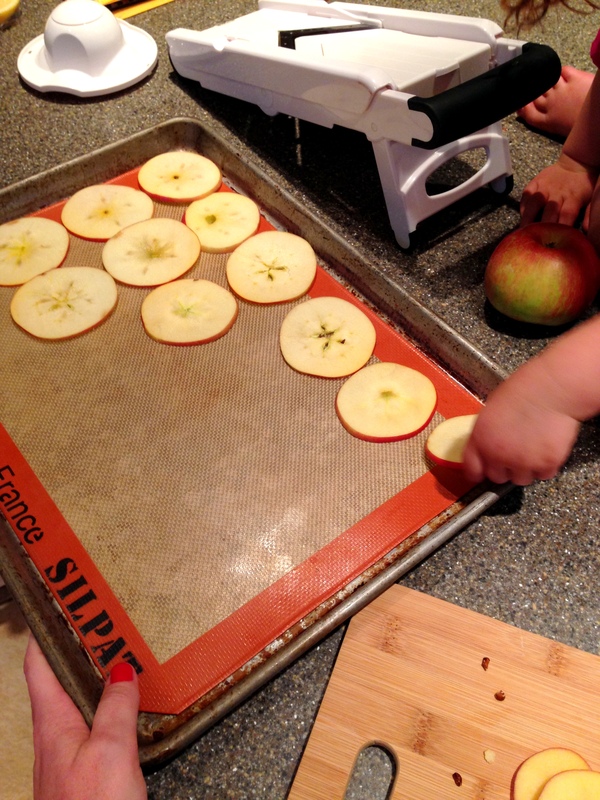 As I chop/cut, it’s the perfect task for your toddler to place your cut item onto the baking sheet or into a bowl. Tossing pre-measured ingredients into the bowl or mixer. I measure the flour, she can pour it in! I measure the nutmeg, she tosses it in the bowl. This one can get messy but they feel really proud when they make in the bowl. Tossing in spices/herbs that don’t require measuring. We put dried parsley in a bunch of recipes and never measure it. 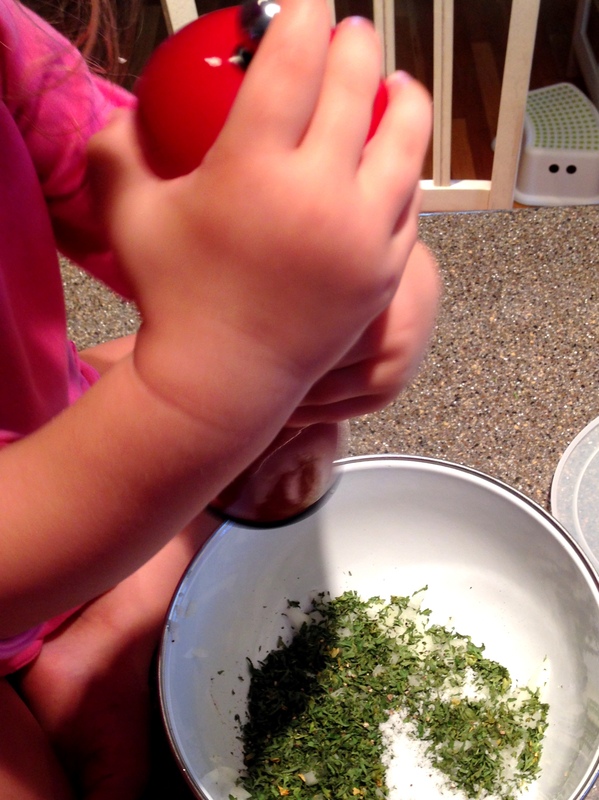 So, Z’s job is to toss in the dried parsley, I tell her when to stop…and most of the time she does, but what’s an extra shake of dried parsley? Grinding pepper falls into this category too. Using benign kitchen appliances. Do I let her use the knife to chop veggies? No. Do I let her use the rolling pin to give the dough an extra roll or 10? Yes. And she always feels awesome about it! 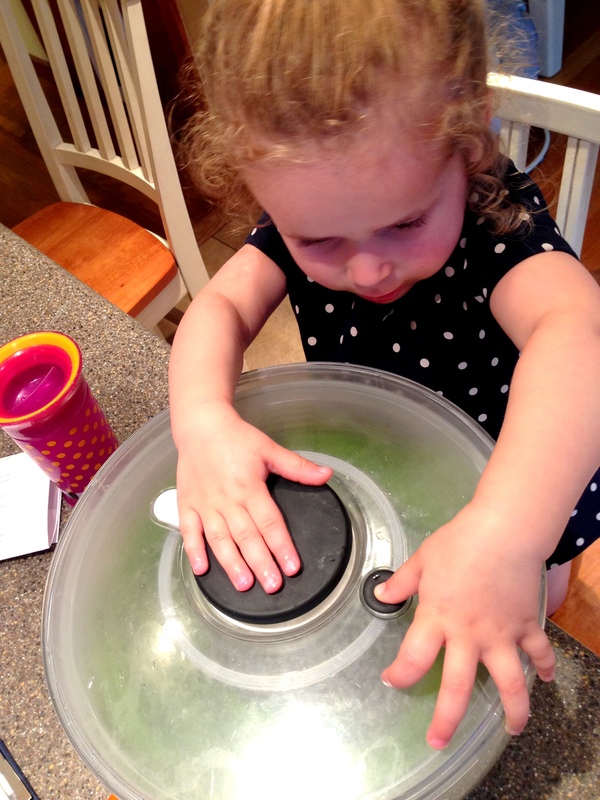 But honestly, the lettuce spinner is her fave benign kitchen appliance – she could spin lettuce for HOURS! Hanging out with a snack. Sometimes “I help” really means, let’s hang out. And she gets to have a snack of whatever I’m making while I make it, not a bad gig! 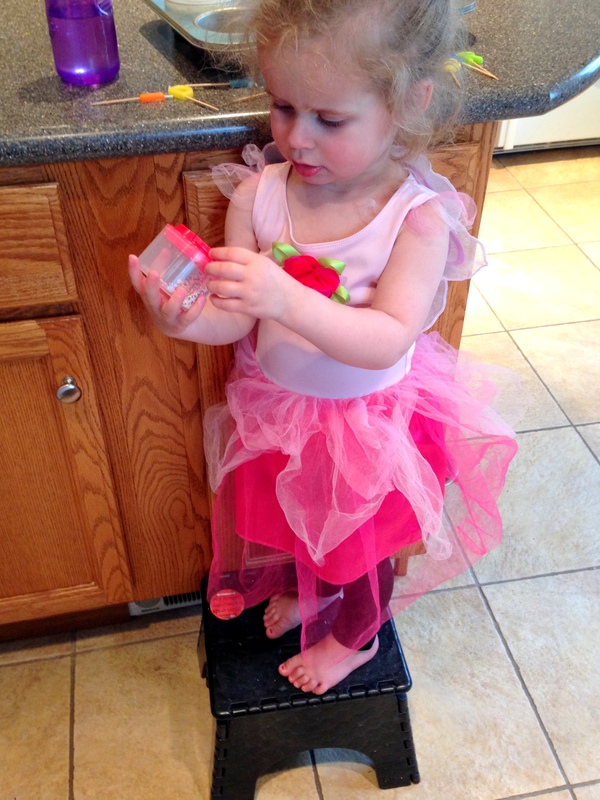 How do you let your little one help in the kitchen? 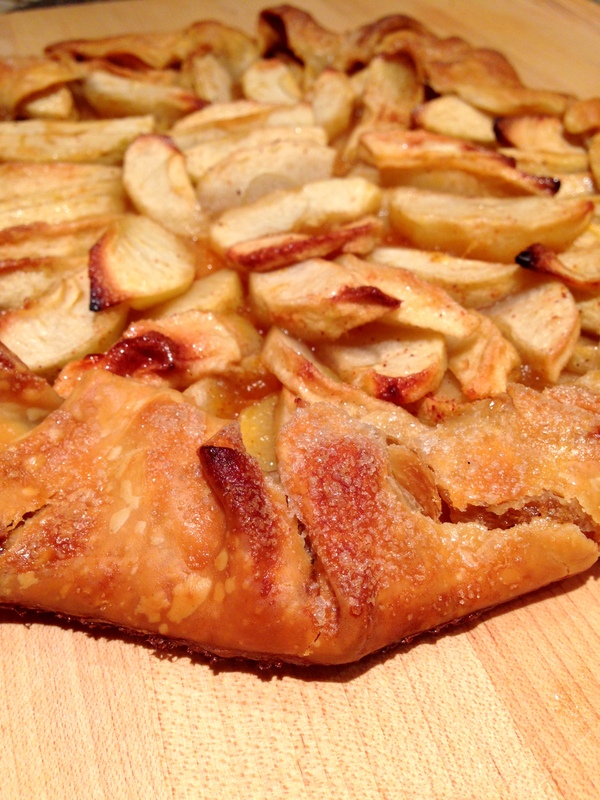 To continue on our post-apple picking baking adventures we made an Apple Galette over the weekend. And what is a galette, you ask? According to Wikipedia, the term galette is used to describe French round or freeform crust cakes. 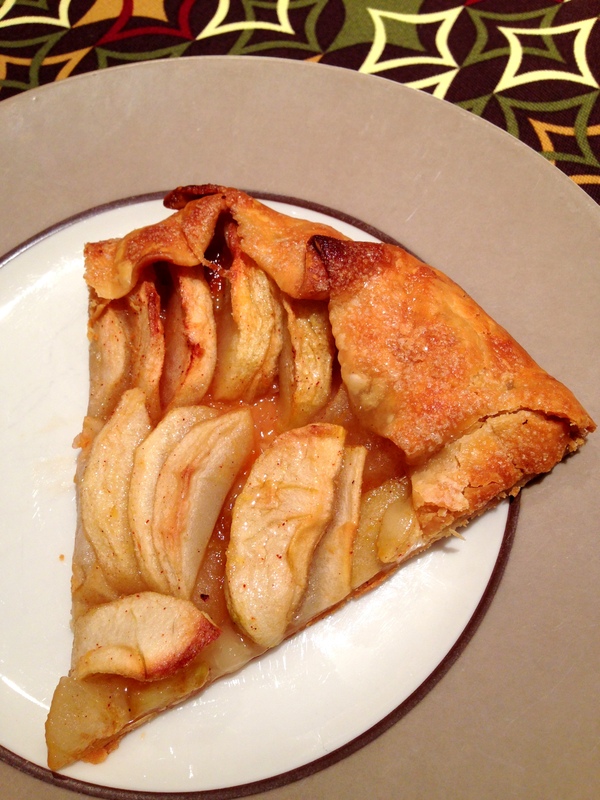 In layman’s terms a galette is a pie with no top baked flat instead of in a pie pan. So anyways, I read through a lot of recipes and I liked the sound of this one from Epicurious the best. We always seem to gravitate towards recipes with the least amount of ingredients. First, peel and core about 6 apples and cut into small wedges. 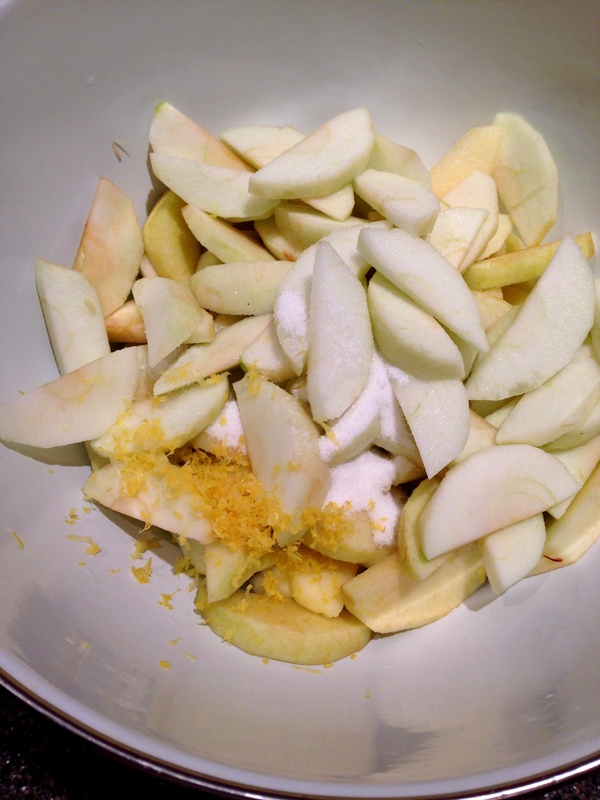 Mix with 2 Tbs sugar, 1 tsp lemon peel, and a dash of cinnamon. 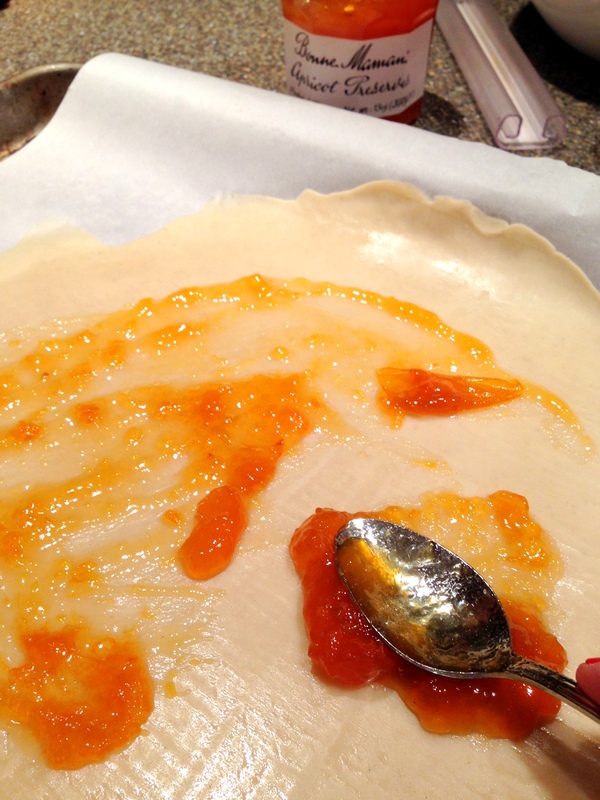 Roll out your pie crust (we totally used a Pillsbury pre-maid crust) and spread a thin layer of apricot jam around the dough, leaving an inch and a half free. Then, arrange your apples to cover the jam overlapping the apples a little. 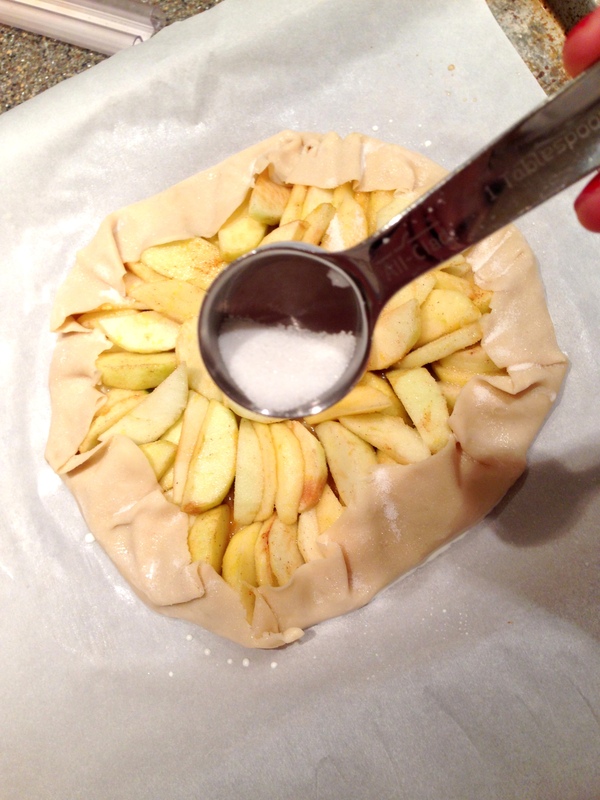 Fold the border of dough on top of the apples. Brush with a little milk (or eggwash) and sprinkle with a dash of sugar, about 1 Tbs. Bake at 425 for 20 mins. Reduce the oven to 375 and cook for another 20-30 until the crust is brown. Always “helping” with tummy time. 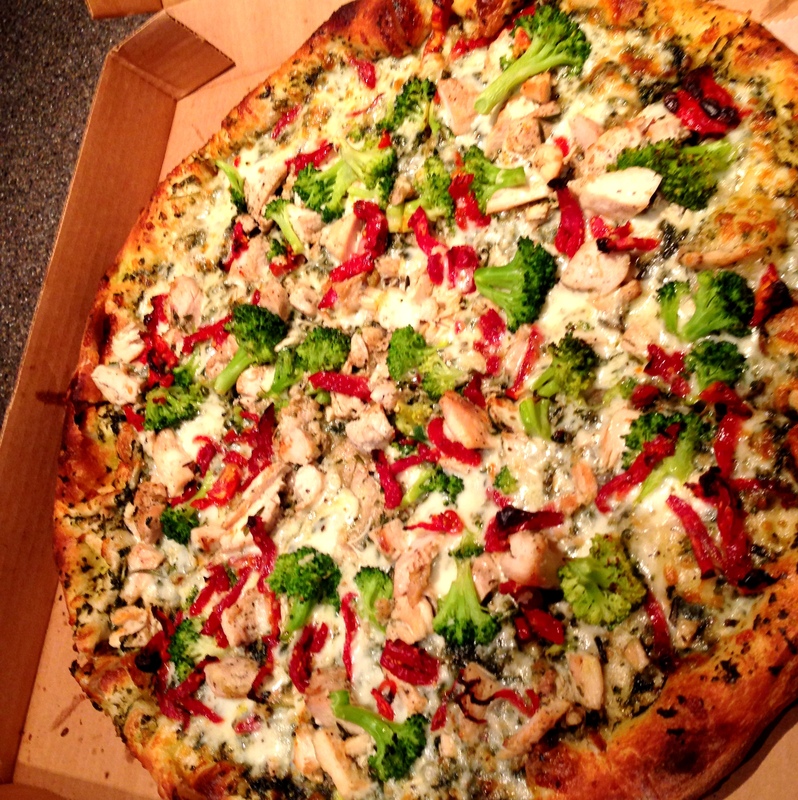 We ordered pizza for dinner for the first time in FOREVER and it was GOOOOD! Dancing in her handmade pompom shirt. 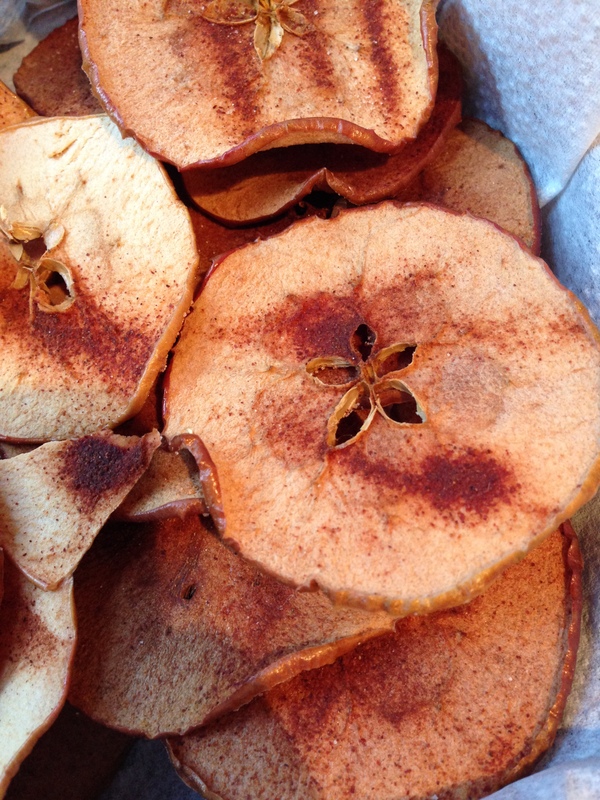 Apple chips. Baked Apple Slices. Whatever you call them – they. are. delicious! If you’re like us, then you’ll go apple picking at least once this fall and find yourself with a large amount of apples. I love to eat them as is but we were searching for a way to use our freshly picked apples above and beyond the standard pie and crisp. 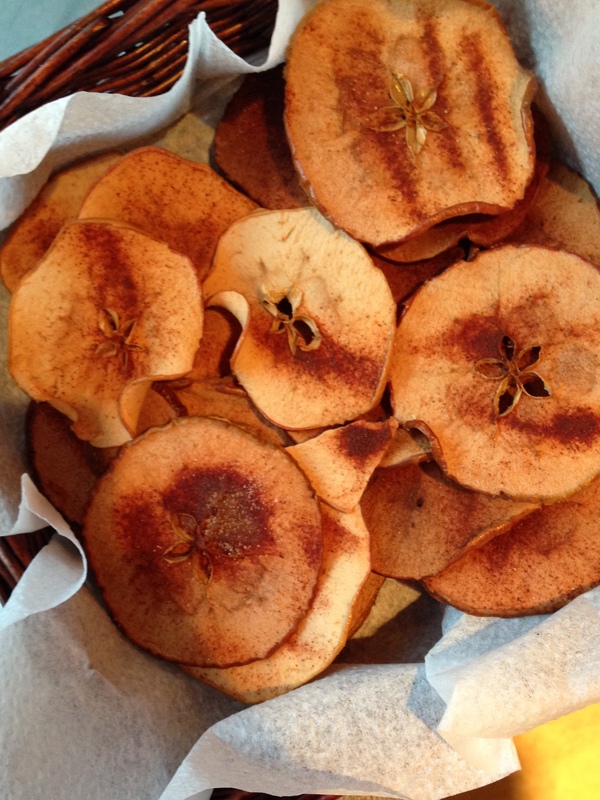 We love our mandolin so we thought we’d try making our own apple chips and boy did they come out great. It’s a bit of work to mandolin all your apples and then bake for 2 hours in batches, but the results are just so yummy I think it’s totally worth it. 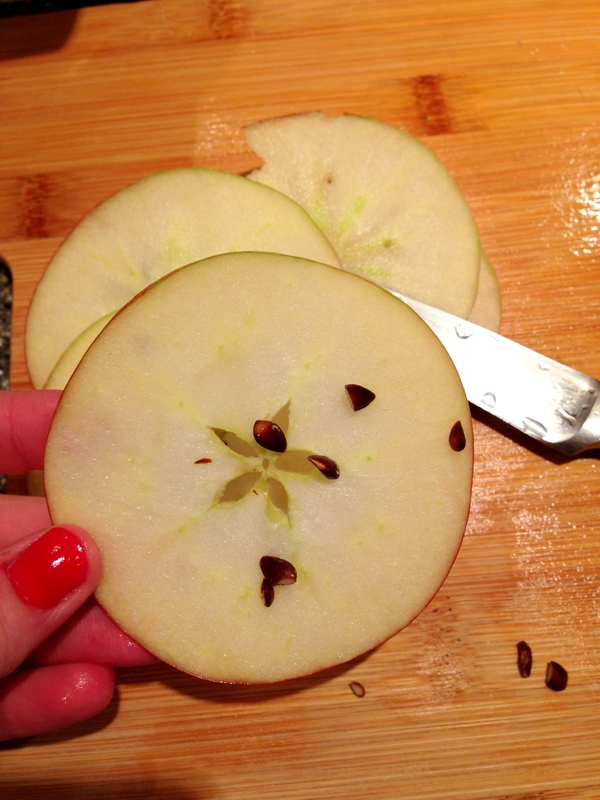 Slice your apples with the 1/8″ size on your mandolin and place on a parchment paper or Silpat lined cookie sheet. Remove any actual seeds but you don’t need to remove the core. 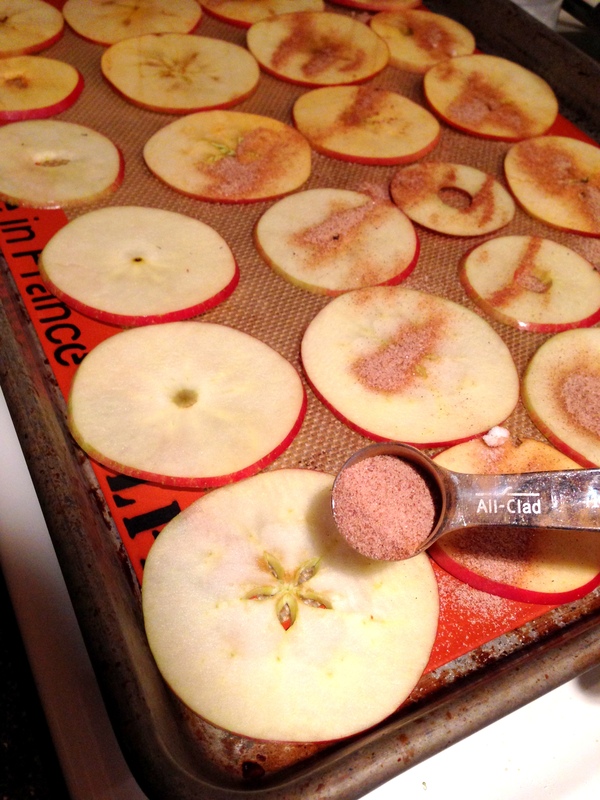 Sprinkle with a little cinnamon sugar mixture (for 6 apples we used 2 Tbs sugar and 1 Tsp cinnamon). – You’ll want to use an “eating” apple for these like a Honey Crisp rather than a “baking” apple like Macintosh. 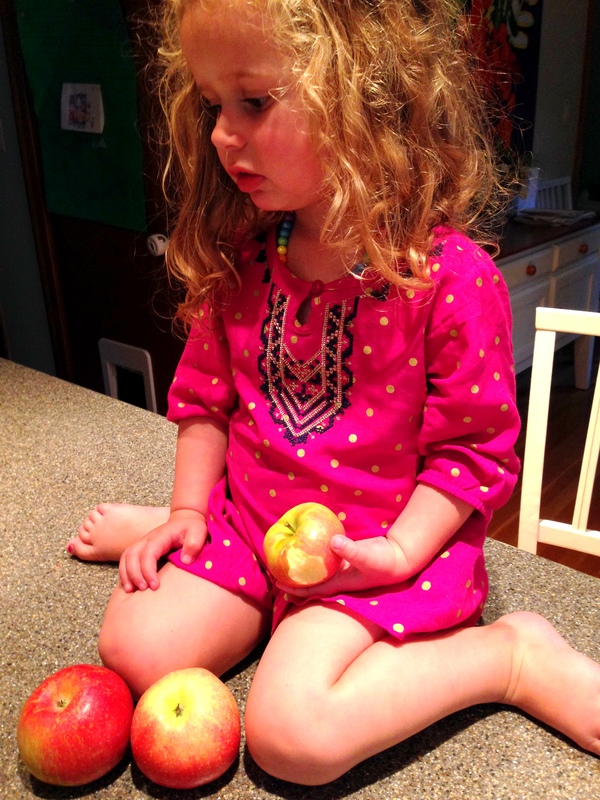 – We fit 3 cut apples on 2 baking sheets. – 2 baking sheets don’t fit side by side in my oven so each sheet was on a different rack. 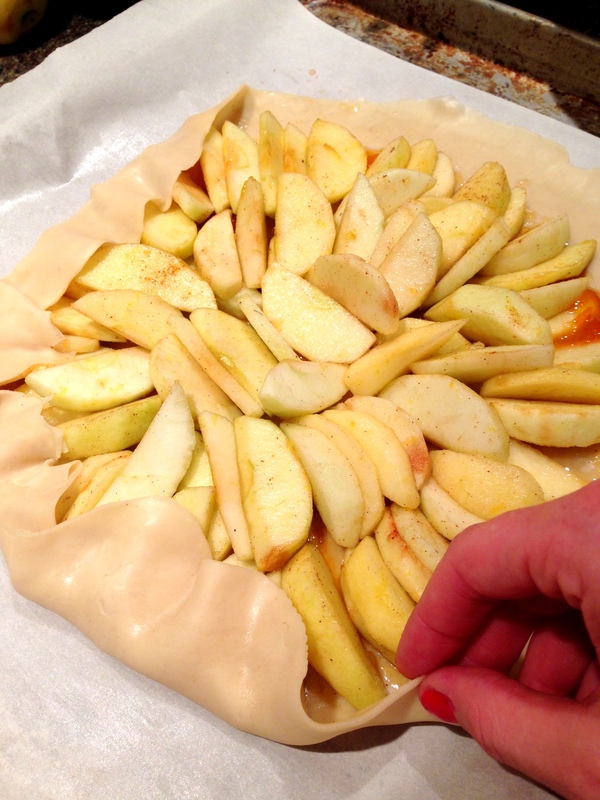 To make sure the apple chips baked evenly, we rotated the baking sheets halfway through baking at 1 hour. – You can use your own judgement on how much cinnamon sugar to add, or don’t use any at all! – We used one baking sheet with a silpat and one with parchment paper and I would say the apples baked on parchment paper came out slightly better. Every year around this time we find ourselves with an overabundance of tomatoes. 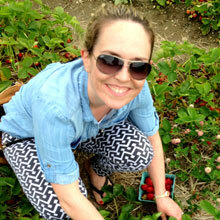 We grow our own AND we belong to a CSA where we get pounds of tomatoes each week. We eat them in every way imaginable but this year we decided to take the plunge and make something with them we’ve been thinking about making for years….tomato sauce. And you know what? It wasn’t as hard as we thought! Sure, it was hours of work for not much yield (in quantity) but the sauce was quite yummy and seemingly extra sweet due to the fresh tomatoes. We made our sauce with about a dozen saladette tomatoes (plum tomatoes), 4 or 5 regular tomatoes, and a handful of cherry tomatoes because I had some leftover from last week. We went through the process of prepping the tomatoes (see below) and then used our trusty marinara recipe that we always use for our sauce. 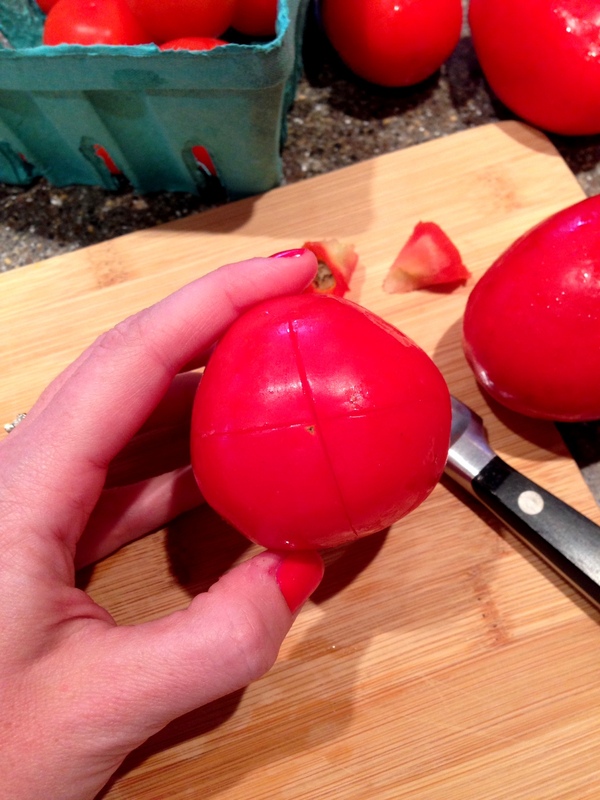 Start by coring the tomato and then cutting and X on the bottom (so it doesn’t burst in the next step). 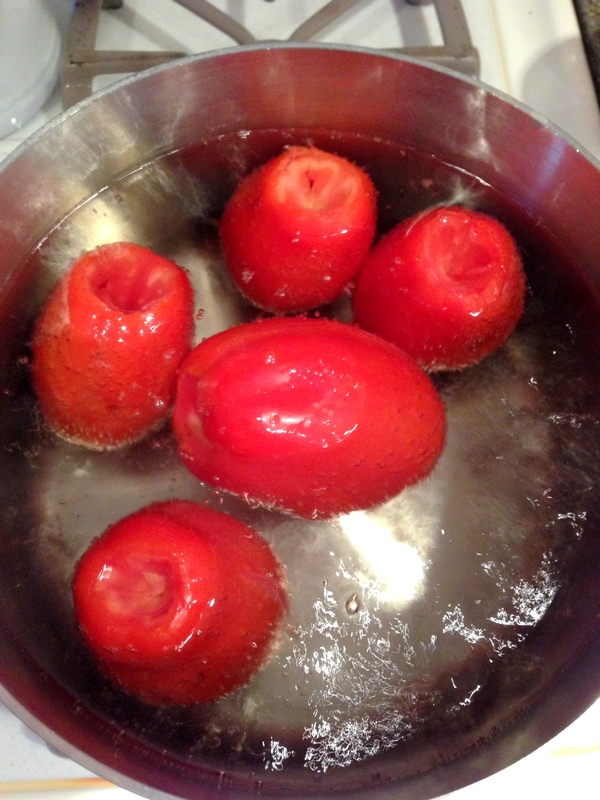 Drop a few of your tomatoes into boiling water and let boil for 60 to 90 seconds. Take the tomatoes out and put right into a bowl of ice water. 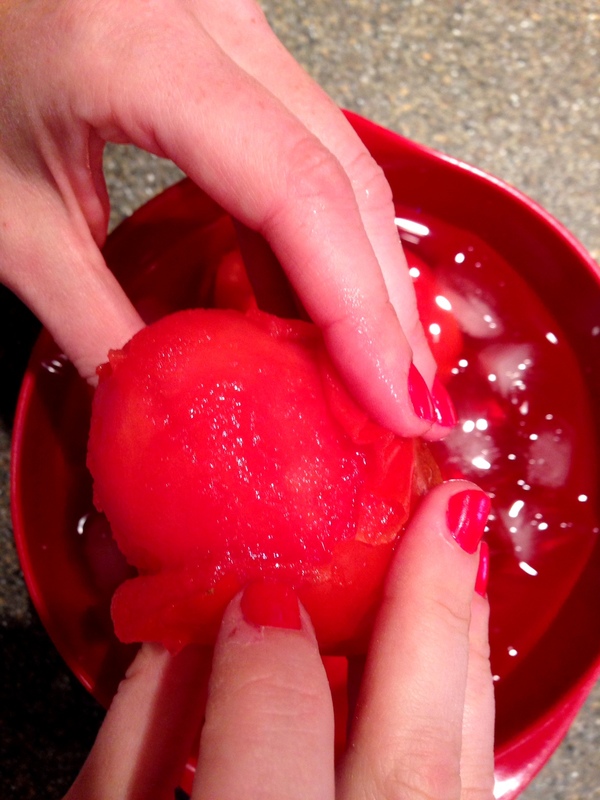 Once the tomatoes are cool enough to handle, peel them. The skins will come right off. We then blended about 3/4 of the tomatoes and chopped the rest so there would be some tecture and chunkiness to our sauce. Then we used these tomatoes as we do the canned tomatoes from this recipe. Did I notice a difference between using canned tomatoes vs. fresh? Definitely. The sauce was sweeter for one thing and a lot more liquid-y so we left it to cook down longer on the stove. You could also taste a freshness to the sauce, if that makes sense. Was it all worth the extra effort? Ummm, maybe not. We really appreciate the invention of canning after this experience, ha! The sauce was great but it was a lot of work to prep the tomatoes and after using a small amount of sauce to make a healthy eggplant parm we were left with enough for just one other use. Do you have tons of tomatoes this time of year? Let me know if you make your own tomato sauce from scratch! 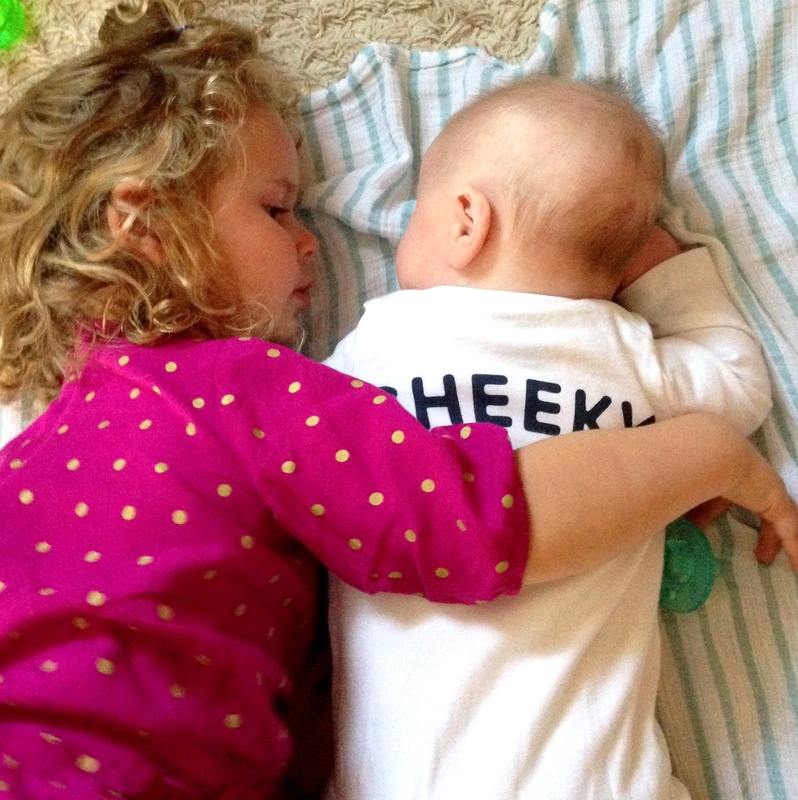 My first restaurant review was published on KidNosh (remember when I told you about KidNosh?). We frequent a pretty great Mexican restaurant in Arlington, MA that has an interesting menu, is good for kids, and is BYOB – La Posada. Catch my review of this restaurant here on KidNosh!